How to customize action toolbars? To customize any toolbar, add or remove any button, simply select menu “Tools->Customize action toolbars…”. Alternatively you can simply click on the action toolbar with the “right mouse button”, and select “Customize action toolbars…”. 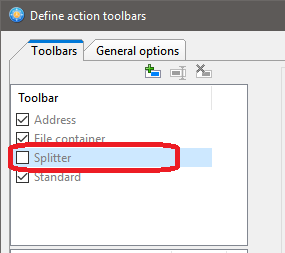 This option is available for the Standard toolbar, Splitter, Address bar, and File container (if available). Can I change the toolbar icon style? Yes, you can change the icon style, right click on the toolbar and choose “Customize action toolbars” → “General options” and uncheck the option “Use flat symbols”. Then restart FreeCommander. How can I change the size of toolbar buttons? 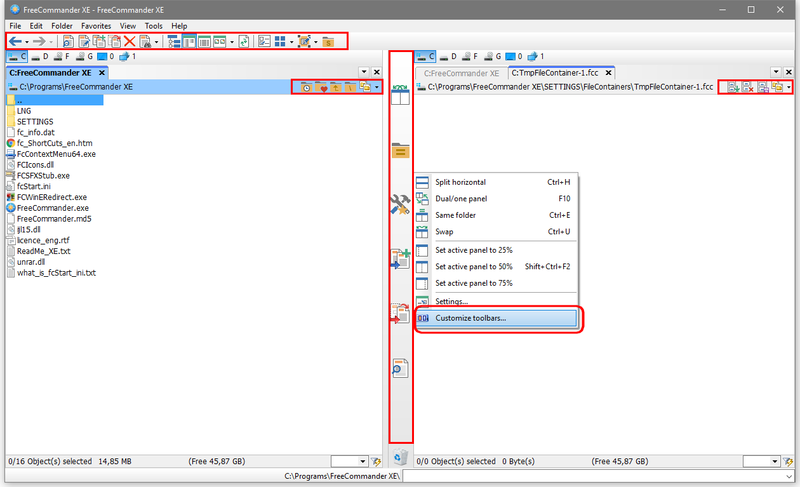 To change the size of the toolbar buttons, right click on the toolbar and choose “Customize action toolbars”, then check the option “Use big icons” and increase the value of the “Button size” option. To change the button size for other toolbars, click the name of the toolbar within the “Toolbar” pane and change the options (if available). The splitter with icons is too wide for me. Can I have a narrow splitter only? Click with the right mouse button over the splitter bar, choose “Customize toolbars…” and uncheck the Splitter checkbox. Some commands have no icons assigned. Can I define my own icon to the command? Click the action toolbar with the “right mouse button”, and select “Customize action toolbars…”. Then click the [ .. ] symbol next to the action, select the path with the icon within the “File” field clicking the […] button, and select the icon within the “Icon” field (if available). Finally click the “OK” button for both dialogs. How can I define my popup menu to the button? For example I would like to define “Refresh all” button with popup menu items for “Refresh” and “Refresh network”. 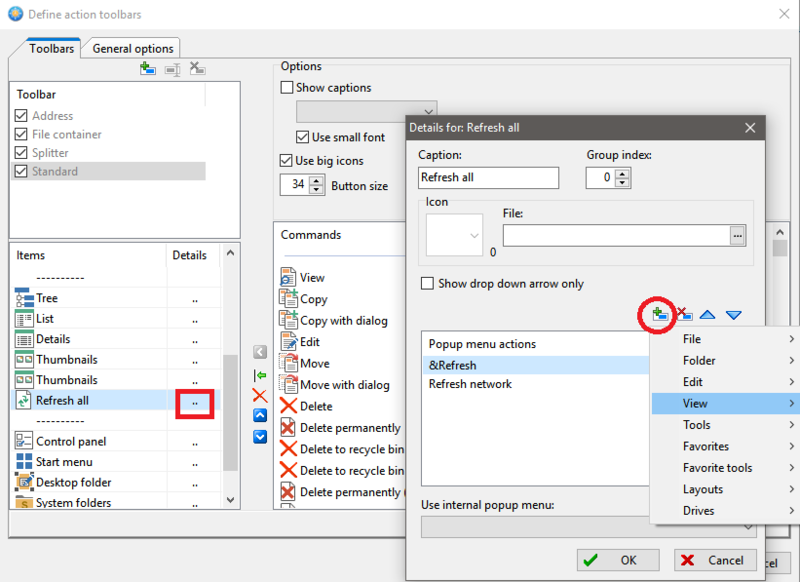 Either an “Internal popup menu” or an “Individual popup menu” (defined in this setting) can be assigned to an item. As soon as a popup menu is assigned to an icon, a drop down arrow is shown behind the icon, than indicates that clicking the icon opens a popup menu. An “Individual popup menu” can be defined only, if no “Internal popup menu” is assigned to the item. For “Individual popup menu” click the “Add new item” button and select the option form the list of commands. For “Internal popup menu” select the option from the “Use internal popup menu:” field. Then click the “OK” button for both dialogs. For example: To add the popup menu items “Refresh” and “Refresh network” for the button “Refresh all”, click the [ .. ] symbol next to the action “Refresh all”, click the “Add new item” button → “View” → click the item “Refresh”, then click the “Add new item” button → “View” → click the item “Refresh All”, then just click the “OK” button for both dialogs. Can I see the title of the buttons? Yes, you can, click the action toolbar with the “right mouse button”, and select “Customize action toolbars…”. Then check the option “Show captions”. Below, you can define the location of the caption from the drop-down menu, and the font size (“Use small font”, if disabled, standard font size will be used). I would like to use the main menu as toolbar. How can I change it? Right click on the toolbar and choose “Customize action toolbars” → “General options” tab, then use the option “many toolbars”, and click the option “Show menu as toolbar”. I don’t use DOS command line bar. Can I hide it from the main window? You can do it in the Settings (F12) → View → DOS Prompt → by unselecting the option “Show Command Line”, or easily right click the status bar and click the option “Show command line” to unselect it. Some buttons have “Group index” defined. When do I need it? If several items of a toolbar have the same group index, only one of them can be active at the same time. Example: In a panel either the “List view” or the “Details view” can be active. Therefore the items “List” and Details” have to have the same group index. An item with group index “0” is independent of the other items. It acts as a function button (e.g. “Unpack…”) or an on/off button (“File system tree panel” on/off) and not as a switch button (“List view”). Which values can I use for my own “Group index”? The values larger than 200 can be used.